Nintendo is working with the nonprofit Institute of Play to bring its popular Labo kits for Nintendo Switch to classrooms in North America. The Institute of Play is developing STEAM curriculum and a teacher guide for Labo and is seeking classrooms to participate. It's already running a pilot in New York. Labo is a making and invention system for the Nintendo Switch gaming platform that brings mixed-reality capabilities to the platform, allowing users to build interactive devices out of cardboard and other materials that can not only interact with games and content on the screen but can be interacted with. For example, users can build a car out of cardboard that can actually move using vibration controlled through Switch. Similarly, they can build a fully functional keyboard out of cardboard and use it to play music through the Switch. With the addition of a feature called Toy-Con Garage, Labo becomes an invention system that allows users to build interactive objects out of any material and create custom programs for them. Up until now, however, Labo has existed purely in the consumer realm. Now, however, the Institute of Play is working to develop resources for bringing it into formal education at the elementary level. "We are always on the lookout for new tools and technologies that combine the best of learning with the spirit of play, and in Nintendo Labo we found an inspiring and innovative approach in both areas," said Arana Shapiro, co-executive director of the Institute of Play, in a prepared statement. 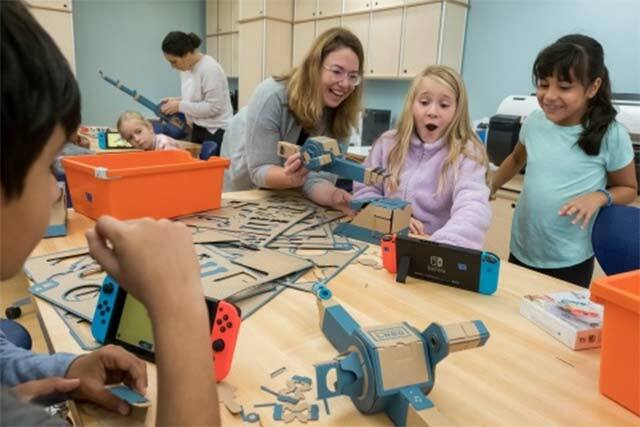 "Teachers in the pilot program are already seeing the natural fit for Nintendo Labo in the classroom, and now we can bring that dynamic to schools across the country." Photo: Nintendo of America. Third-grade students at the Douglass G Grafflin School in Chappaqua, NY, participate in an interactive learning session with the Nintendo Labo: Variety Kit for the Nintendo Switch system, led by Rebecca Rufo-Tepper, Co-Executive Director of the Institute of Play. According to Nintendo, "The Institute of Play is currently conducting a pilot program with schools in the greater New York area. Nintendo and the Institute of Play will use these pilot classes to develop a Nintendo Labo Teacher Guide that will allow other educators to implement Nintendo Labo in the classroom to promote the development of skills such as creative problem solving and collaboration. The Nintendo Labo Teacher Guide will include sample lesson plans and learning modules dedicated to basic elements of STEAM and the Make, Play and Discover components of Nintendo Labo. The guide will be available for free later this fall to anyone who wants to incorporate Nintendo Labo into their classrooms or homes." The Institute of play is currently seeking classrooms across the United States to participate in a special program once the pilot in New York is completed. Nintendo will provide about 100 schools with Switch systems and Labo Variety Kits, as well as the Teacher Guide. The program will be open to schools in the United States and Canada. "The ingenuity of Nintendo Switch brings Nintendo Labo to life to provide a fun way for kids to explore basic STEAM topics together and be entertained while building a fundamental understanding of the technology behind them," said Nintendo of America President and COO Reggie Fils-Aime, also in a prepared statement. "We hope our programs in the United States and Canada encourage kids to explore, tinker, problem-solve and, in the process, get excited about design and technology — all while having fun." Further information can be found at labo.nintendo.com/classroom.